Tuscany at Abacoa nestled between Martinique and Charleston Court was built by DiVosta Homes in 2004 and consists of 450+ Mediterranean style single family homes and town homes about a mile from the heart of Abaoca’s Town Center. Many overlooking the preserves with access to trails for walking and bird watching. In addition, Tuscany at Abacoa features a community pool, clubhouse, green area, and children's playground. HOA for Tuscany rates roughly $744 a quarter and includes common area maintenance and basic cable connection. Abacoa Mediterranean style homes surround a main street-style Town Center. 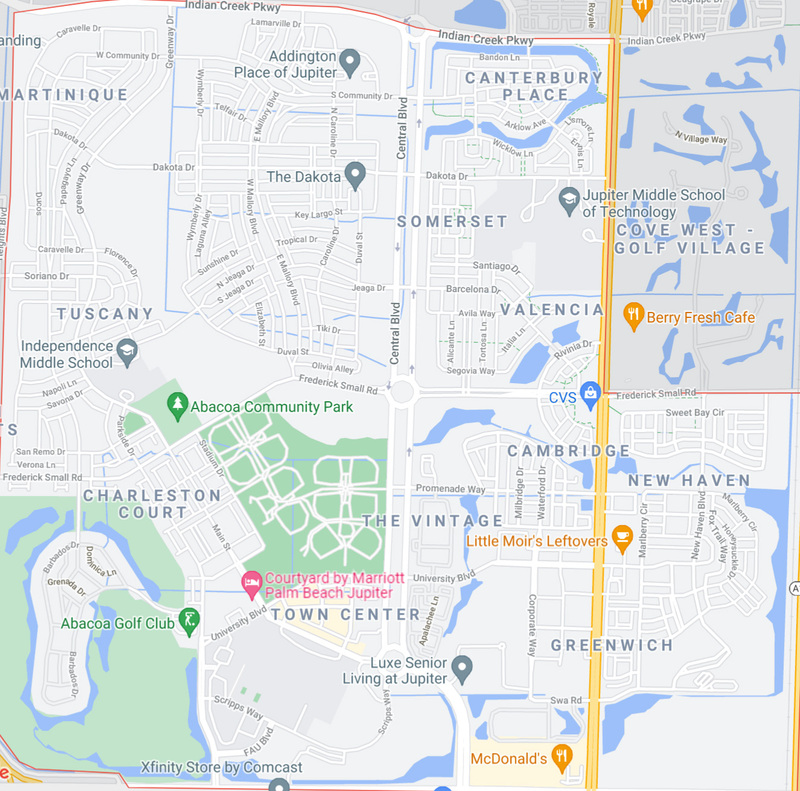 All streets, sidewalks and greenways of Abacoa interconnect, encouraging residents to stroll or bike to any area of the neighborhood. Everyone living at Abacoa may take advantage of the community amenities including a club house, recreation center, playground and a nature preserve with a walking trail. Tuscany at Abacoa is one of Palm Beach County's newest and most unique home communities and is comprised of 453 homes. The community of Abacoa involves several diverse neighborhoods. The entire real estate development was designed around the concepts of a traditional neighborhood . Homes for sale range in price between $295,000 and $800,000. The Tuscany neighborhood offers significantly larger townhomes for sale than those available in other Abacoa neighborhoods, but for the same price. Townhome floor plans include duplex models, as well as row-style town homes consisting of six units per building. Many of these town homes feature a courtyard allowing space for outdoor living and a wonderful view of the nature preserve. All the Tuscany townhomes feature a detached 2 car garage with a private patio. HOA fees for the townhomes are $600/quarter and include common area maintenance and basic cable television. Multiple single family floorplans ranging from a 1,500+ to over 3,000+ square feet of living space makes purchasing a Tuscany at Abacoa home desirable. Or if buying a Jupiter townhome is preferred there are 3 floorplans ranging around 1,800 square feet of living space to chose from.